To my mind cinema plays an important role in the life of any society. Without any doubt cinema is one of the best ways of spending your leisure time. You can always find the film you like among horror films, crime stories, action films, love, musical, drama films or comedies. A lot of children and adults are fond of cartoons. Nowadays there are a lot of modern cinemas where you can sit in comfortable chairs, eat popcorn, drink coke and watch 3D films at the same time. But, to tell the truth, I don’t feel I like the way some young people behave during the review. As for me, I live in a small settlement (village) and there is only one old cinema in it. So, I am not a cinema-goer that’s why I prefer to watch films on TV or DVD-films. 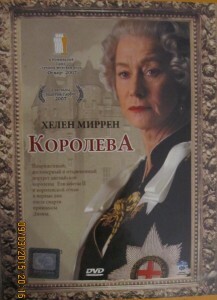 Not long ago I saw the film “The Queen”. It is a 2006 British-French-Italian drama film that was directed by Stephen Frears and starring Helen Mirren as a title (leading) role of Queen Elizabeth II. Michael Sheen played Tony Blair, the Prime Minister of the UK. By the way, Mirren was born Helen Lydia Mironoff in 1945 in West London. Her father, Vasiliy Petrovich Mironov (1913–1980), was of Russian origin, and her mother, the former Kathleen Alexandrina Eva Matilda Rogers (1909–1996), was born in England. Helen Mirren won a Golden Globe and an Oscar for Best Actress in a Leading Role for this film in 2007. The film was released almost ten years after this sad event. The film depicts a lot of the events that happened after Diana's death on the 31st of August 1997. Diana, a Princess of Wales died in a car crash in Alma Bridge tunnel in Paris along with her companion Dody Fayed. The main plot focuses on the different views in how to deal with the death of Diana. The Queen Elizabeth II, her husband and their both grandsons were at Balmoral Castle in Scotland on their summer residence when the accident took place. Diana and her ex-husband Prince Charles had been divorced by that time that is why the Queen considered her death as a private affair. On the contrary, Tony Blair, a newly-appointed Prime Minister and Diana's ex-husband attempt to reflect the public wish for an official expression of grief. Blair gives a speech in which he describes Diana as “the people’s princess” and the phrase catches on. . The Queen decides to carry out the recommendations of Blair. In the conclusion of the film, the Royal Family returns to London to inspect the floral tributes. The Queen also speaks about Diana's life on television and describes Diana as «an exceptional and gifted human being.» As a result the Queen has regained her popularity. I liked the film because all actors played very naturally and convincing. As for Helen Mirren her performance was unforgettable. Всем любителям английского языка рекомендую настоятельно посмотреть этот фильм. Сначала смотрите русскую версию, затем с субтитрами, а потом — версию на английском языке. Моим ученикам очень нравится этот фильм. Думаю, и вас он не оставит равнодушным. Кроме этого вы получите хорошую практику в восприятии английской речи на слух, познакомитесь с традициями английского общества. Всем приятного просмотра!!! Эта запись написана автором Елена Шрамкова, 09.03.2015 в 20:38, и размещена в категории Топики. Следите за ответами на эту запись с помощью RSS 2.0. Вы можете написать комментарий или разместить обратную ссылку на своем сайте.